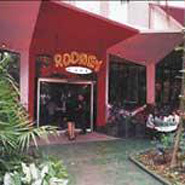 Cabaret Tropicana was built in 1939 in the Havana neighborhood of Marianao. Once considered a risk taken by an entrepreneur who decided to open a restaurant with night club entertainment with a capacity for at least 300 visitors. At the time many considered his idea unfeasible yet today Cabaret Tropicana is on of Havana’s most popular tourism venues. 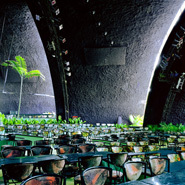 Tropicana Cabaret is located in vibrant forest with large majestic trees, such as Royal Palms, Mamoncillos, Mango trees, Cedar and many others, giving the theater its cool tropical feeling. Nat King Cole, Josephine Baker, Libertad Lamarque, Cheo Feliciano, Rita Montaner, Elena Burke and Bola de Nieve and many other celebrities were amongst the many stars who have appeared on Tropicana’s illustrious stage. Performances are conducted right under the stars of Havana’s night sky. In 1992, the American Academy of Restaurant Industry bestowed Tropicana with an honorable award as the “Best of the Five Stars Diamond” for being the best cabaret in the Americas, recognized for its quality and appreciated for its rich history of over more than half a century. The actual program “Tambores en Concierto” meaning Concert Drum was composed by the renowned choreographer and master Tomás Morales. It is a ballade featuring the most recognized and authentic Cuban rhythms, without ignoring the Hispanic and African heritage of Cuba, including rumba, mambo, danzonete and Latin jazz. To visit Tropicana Cabaret please visit click to chat with our booking agents or contact us. We offer special deals for groups over 6 people, including preferential seating and extras. Tropicana Cabaret is the oldest Cabaret show. It’s located in Havana. There are dinner and show tours nightly or over night from most hotels and resorts. 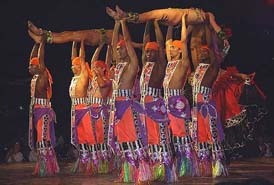 It’s a grand show at an outdoor theatre with many dancers in elaborate costumes. 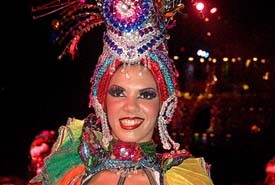 Tropicana Cabaret is immensely popular in Havana, which is something of a paradox. It is perhaps surprising that an art form derived from de days of sleaze and decadence and symbolizing everything that the revolution abhors should have survived to thrive in revolutionary Cuba. You might have thought that cabaret could have come under the ax during the moral political purges of the early 1970s, but not at all. Gentle, inoffensive homosexual poets were hounded, but the blatantly exploitative breasts and asses razzmatazz of the Tropicana Cabaret flourished unabated. 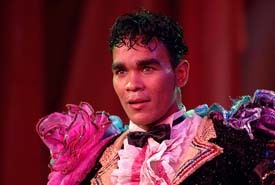 Cubans love their Tropicana Cabaret or shows as they are known. Every provincial town has its own version of Tropicana Cabaret, some worse than others, but the basic formula is the same: a compere, a romantic tenor, a soprano, possibly a comedian and above all, the dancers! In Havana, cabarets are mostly located at the hotels. The Hotel Nacional de Cuba has a good one called Cabaret Parisien with obvious French flair, as does the Havana Cafe on Paseo next to the hotel Melia Cohiba. This one takes place against a particularly good setting of fifties memorabilia including an old Buick. 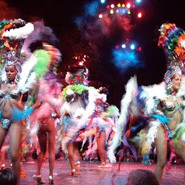 There are shows at the Salon Rojo next to the Hotel Capri and in the Hotel Habana Libre`s Turquino, but the creme of cabarets in Havana is Tropicana in Marianao, in Calle 72 between 41 and 45. Being on honeymoon and with more money than usual to spend, we decided to purchase the tickets which were 85 convertible pesos each about 120 USD. 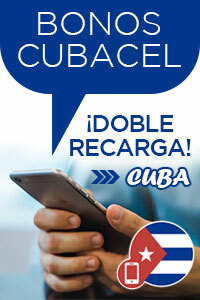 Considering the costs of other activities in Cuba, the show ranked easily as the most expensive but we were probably swept along by the “don’t want to miss out just in case it’s really amazing” temptation you can get when away. We spent $200 to see this and that doesn’t include dinner. The show was moved indoors due to inclement weather which meant that the show was nearly an hour late starting and they don’t serve your inclusive drinks or snacks until the show starts! With the exception of the balancing act, the show was tired and repetitive. The dancers looked bored and disinterested. Because we had booked a taxi to collect us at the time it would normally have finished, we had to leave early. In some ways this was a relief. We have seen many of these tourist type shows over the years and this has been the worst. On arrival to Tropicana Cabaret, having paid our 5 convertible pesos to use our camera, we were seated in the middle row, which we had paid for, although found ourselves at the very back of a table of ten people – and observed that the cheaper row behind us would in fact provide a less obscured view. The show is open air and it had been raining for several hours before, resulting in a tick-tock of droplets on our heads! Despite there being drink and food at Tropicana Cabaret as part of the ticket price, we spent the first 20mins without them and were instead offered to order drinks – we ordered a lager and a water which came to 8 convertible pesos, again very expensive. All this resulted in us feeling uncomfortable and pretty negative about the show from the start, which probably impacted on the rest of our night. Longed legged middle aged Tropicana dancer in great shape! 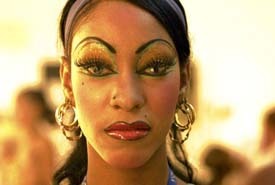 The menacing stare makes you wonder what could be next? Surrounded by lush vegetation visits can enjoy a glittering spectacle featuring over 200 singers, dancers, musicians and vocalists. 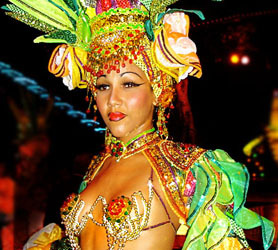 The Tropicana Cabaret is Cuba’s most famous cabaret and is offered by Havanatur Bookings. It Opened in 1931, it’s known as the “Paradise under the Stars” and it has been pleasing crowds ever since. Tickets can be ordered by phone from 10am – 6pm or buy them at the ticket booth at 8:30 pm (call ahead of time to check availability) reservations can be made through any travel agency desk located in most of the hotels. 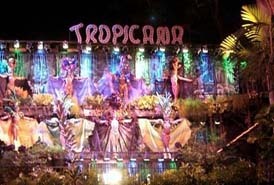 Even though the Tropicana cabaret is a bit pricy it’s worth every convertible pesos. The dancers, the dresses and the live music all make you just sit back and enjoy the atmosphere at the outdoor scene that is converted to a dance floor for the audience after the show. I had a ringside seat and almost had to duck when the skirts were whirling around. If you want to take pictures it’s an extra 5 CUC.If you want to take video it’s an extra 15 CUC. My recipe for the camera was checked twice. Just keep it in your shirt pocket and the whole deal of showing it is a 3 second thing – no need to take your eyes off the show! The fantasies in the show can challenge everyone. When my 7 year old nephew saw my pictures he was totally amused: “She’s dancing with a chandelier on her head. It’s lit, and it hasn’t even fallen from the ceiling? 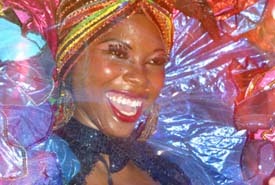 Cuban Mambo Cabaret Tropicana – Havana, Cuba … Cuban Mambo danced by professional dancers in Tropicana..